Lama Zopa Rinpoche “opens the eyes” of FPMT’s first holy object, Tara statue, Kopan Monastery, 1976Objects become “holy” when they contain the presence of a buddha’s holy body, holy speech or holy mind. There are several ways in which to engage with holy objects. You can make offerings, prostrations and circumambulate the holy objects that already exist, you can create holy objects that become future sources of blessings and pilgrimage to others, and you can also help sponsor a holy object initiative with volunteer time, money or prayers. Holy objects can even be used to benefit animals. 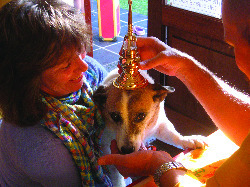 Although animals may have a difficult time with making offerings, you can always help them to circumambulate; give them a nice gentle bonk on the head with your stupas, statues and tsa-tsas; or recite mantras for them. All of these activities, when in relation to a holy object, become incredibly powerful acts of virtue. 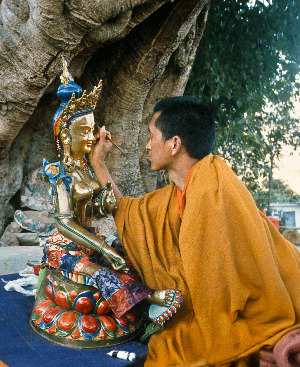 Lama Yeshe and Lama Zopa Rinpoche firmly established FPMT’s relationship with holy objects in 1976 when the first statue of FPMT, a substantive three-foot (one-meter) tall Tara statue (see photo above), was obtained and brought to life at Kopan Monastery. From this first auspicious project countless initiatives have blossomed, bringing symbols of Buddha’s holy body, speech and mind into the world. Every saint or spiritual leader becomes well-known for specific benevolent deeds in which they have engaged for the benefit of the world. Under Lama Zopa Rinpoche’s advice and care, FPMT has made the creation of holy objects a central mission of the international organization. Lama Zopa Rinpoche has personally inspired or commissioned the creation of hundreds of thousands of holy objects from the casting commitments of tsa-tsas he’s given students or suggestions for larger projects like statues, stupas, prayer wheels and large thangkas to be created on FPMT grounds. Lama Zopa Rinpoche’s advice regarding holy objects can be found on his Advice Page as well as on the Lama Yeshe Wisdom Archive’s Online Advice Book. Extensive auspicious offerings are made to holy objects by many FPMT centers, projects and services around the world. Please rejoice in some of this amazing activity.